The truth is, live bonsai are much more fun than dead ones! So, to keep things as fun as possible, we have to learn to keep our bonsai alive. Yes, learn! And it's not always easy, because there is a lot to learn. Anyway, this page is dedicated to keeping your trees healthy, happy and green! 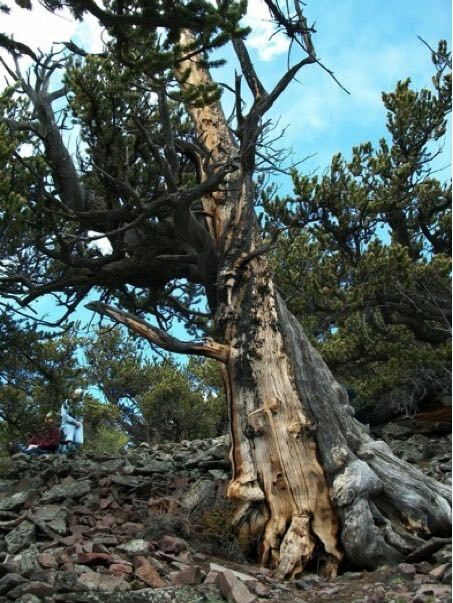 For over 2,500 years no one ever watered this tree and it's still doing fine. How come mine can't even miss a day? 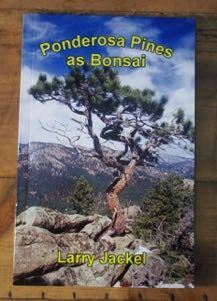 The best book you can get on training ponderosa pines for bonsai. 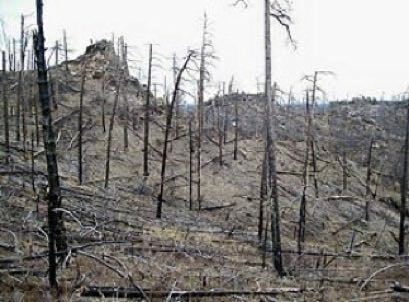 To see some of the oldest known trees in the Black Hills check out: www.facebook.com/BlackHillsAncientTreeProject. This is a catalog of old trees I started several years ago. Hopefully I'll find time to work on it some more soon. I don't know close to everything about bonsai, nor close to everything about plant care, nor even close to everything about my little toe! 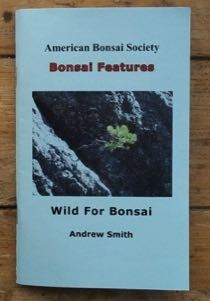 But, I have been growing bonsai obsessively for 20+ years now, and I know more about it than I used to know. The links below give my advice for care of some of the species I commonly collect. If you read them, you may notice that much of the advice is the same, no matter what the species. That's because bonsai care, in general, is fairly consistent. But there are some differences with each species. I'll add more to this as I learn more. If you have a question that isn't addressed, feel free to send me an email and ask. You really never know what you are going to run into. 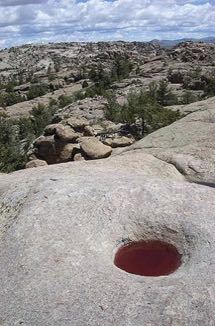 One day when I was collecting junipers I found this ruby red water basin up on the rocks. I've never seen anything like it, before or since. 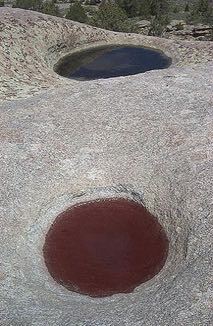 A friend told me that sometimes granite water basins will turn red due to iron deposits in the granite. Maybe that was it. What I always used to say was, "trees grow where seeds fall, not where the soil is perfect." That's true, but it's not good enough for bonsai. 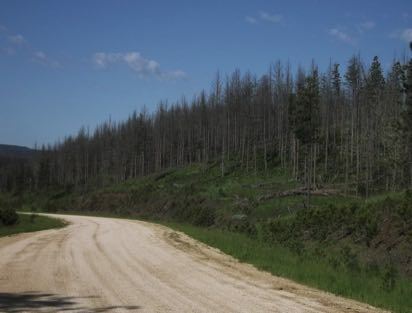 Trees are very much products of their environment -for instance, a seed that might easily grow into a 100 foot tall pine after a century in good soil, might just as easily grow into a 10 inch tall pine after a century in a tiny rock crevice. It follows then that the soil we use for our bonsai will have an enormous effect on how they grow. 5 parts pumice, 2 parts red lava, 2 parts pea gravel, 1/2 part pine bark, 1/2 part horticultural charcoal. All screened to remove dust and fines and ideally get a particle size between 1/8-3/8" diameter. This is what I use for pines and junipers. For spruce I add a half part more bark to retain more moisture. For deciduous trees I use 3 parts of this mix with 1 part potting soil, usually the kind used for cactus and succulents. The links below will take you to a few other articles I've written that at least have the word "tree" in them somewhere, at least, most of them do. However, be forewarned that a shadowy path is hard to follow and you never know where you will come out in the end! I, sometimes with a lot of help, collect several hundred trees per year for bonsai. 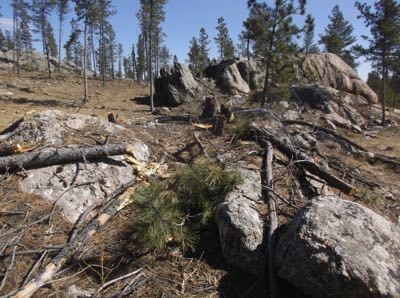 I collect trees mainly on National Forest, State and Bureau of Land Management lands where it is legal to do so, under a purchased permit for each tree. This is a regulated activity that is permitted only in certain areas. 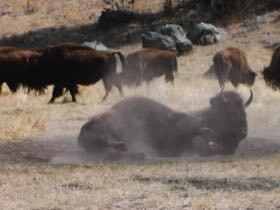 Collecting in National Parks, National Monuments, Wilderness Areas, areas of special historic, cultural or biological significance, or near main roads, campgrounds, lakeshores or hiking trails is almost always forbidden. Collecting rare or endangered plants is also forbidden. Collecting trees for bonsai is becoming more popular. As long as collectors respect the land and the resource and "tread lightly", we should be able to continue with our passion. 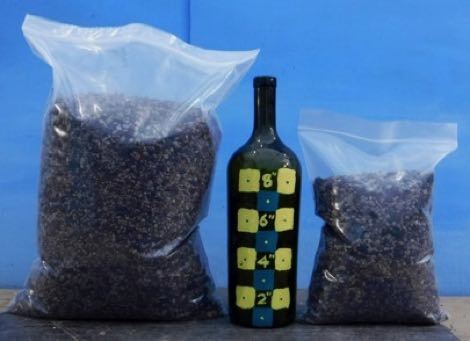 However, if collectors give themselves a reputation for being greedy and destructive, more and more areas will be closed. Trees move and live at a much different pace than humans do. One of the biggest reasons I have seen for failure in a bonsai is trying to move it too far, too fast. In general, a tree should not be exposed to more than one major stress per year. And if it takes the tree more than a year to recover, then let it take all the time it needs. Going slow and reaching the goal is faster than going too fast and wrecking along the way. First growing season (spring): Collect and transplant the tree. Keep it under white poly until new growth is established. Grow it through the season. Second growing season: Allow the tree to grow all season. Prune unnecessary branches. If the tree is strong, consider styling in the late winter/early spring. Third growing season: Allow the tree to continue growing. Continue pruning where needed. Fourth growing season (spring): If the tree has been growing strongly this might be a good time to repot into a better pot. Subsequent growing seasons: Focus on foliage and branch refinement. This schedule should be modified depending on how the tree is doing. After each step (transplanting, wiring, etc.) the tree should be allowed at least a growing season to regain strength. If it needs more than one growing season, then give it what it needs. Some yamadori in Japan are allowed to grow for over 20 years before they are worked on! But then they are strong enough to easily survive styling. On the other hand, some trees transplant with virtually no problems and start out strong. In that case the schedule can be moved up a bit. But remember, if in doubt, you will almost never err in waiting.